Tom Alner open-shoved the small blind and Neil Channing called from the big blind. Channing was ahead before the flop with A 9 against Alner’s J 8 . The board came 9 3 2 3 K , offering no help for Tom Alner who was eliminated in 4th place ($207,019). Channing moved up to about 9.1 million after the hand. Right after doubling through chipleader Neil Channing, James Mackey gave it all back on the very next hand. Mackey was all in before the flop with K Q against Channing’s 5 5 . The board came K 4 3 3 5 , giving Mackey top pair on the flop to take the lead, but Channing spiked a set on the river to win the pot. James Mackey was eliminated in 3rd place ($286,633), while Neil Channing broke the 10-million chip mark that hand. Channing took the chip lead going into heads-up play with 10,200,000 to Henry Lu’s 2,250,000. The final table of Event no. 43 ($1,500 No-Limit Hold’em) is now underway, and Card Player will be posting level-by-level updates with all of the action, current chip counts, and prize distributions. Day 3 began with 20 players spread out over 3 tables, and with the elimination of Zach Clark in 10th Place ($37,657), the final table is now set. Play will begin in Level 25 with blinds of 15,000-30,000 with a 5,000 ante, and will continue until a winner is determined. Day 2 is in the books. Just 85 players remain out of the 1,941 that began the tournament. The next player eliminated will receive $7,589. First place will take home $825,976. Bracelet-winner James Mackey is still alive in the event. He currently sits with a massive stack of over 1,000,000. Action will resume at 3 p.m. PDT on Sunday and might conclude when a final table is reached. However, depending on how the event plays out, a winner could be crowned on the third day. Day 3 will resume this afternoon. Just 73 players remain out of the 1,941 that began the tournament. Bracelet-winner James Mackey is still alive in the event. He currently sits with a massive stack of over 1,000,000 and is the overwhelming chip leader. Other notables still remaining include Jon Turner, Isaac Baron, Dan Shak, Craig Marquis, Gabe Costner, Mark Newhouse, Josh Brikis, Lars Bonding, Mike Watson, David Baker. Action will resume at 3 p.m. PDT today and might conclude when a final table is reached. However, depending on how the event plays out, a winner could be crowned on the fourth day. Townsend’s trip-eights caused Lindgren to muck his hand and Townsend took the pot. He was at 300,000 while Lindgren was down to just 22,500. Justin Smith raised to 8,000 from under the gun and Daniel Alaei made the call from the cutoff. Al Barbieri was in the big blind and threw in the extra 4,000 to see a flop. It came down 7 5 3 . Barbieri bet 4,000 and Smith raised to 8,000. Alaei got out of the way and Smith made the call. The turn was the Q and Barbieri led out with 8,000. Smith called and the 10 came on the river. Barbieri bet another 8,000 and Smith called. Barbieri turned over 9 2 for a flush and Smith mucked. Barbieri took the pot and was at 150,000 while Smith was down to 61,000. Smith would bust later in the level on a seven-card stud hand. A few hands after losing to Brian Townsend, Erick Lindgren was all in holding Q Q . He was up against Greg Raymer’s A J and Andrew Brown’s K Q . The flop came down K 5 4 , giving Brown top pair and Raymer the nut-flush draw. The turn was the 9 and Lindgren needed the case queen to stay alive. But the K fell on the river and Lindgren was eliminated. Steve Billirakis raised to 8,000 from the cutoff and Scotty Nguyen called from the button. Phil Galfond tagged along from the big blind and the flop came down K 8 4 . Billirakis bet 4,000 and both opponents called. The turn was the 4 and Billirakis bet 8,000. Both players called and the 4 came on the river. Billirakis bet 8,000 more and Nguyen was the only caller. Billirakis turned over A A J 5 for a full house and Nguyen mucked. Billirakis was up to 280,000 while Nguyen was around 85,000. Scotty Nguyen raised to 8,000 and Chris Ferguson made the call from the big blind. The flop came down K Q 3 and both players checked. The 6 fell on the turn and both players went nuts. Ferguson’s chips eventually all got into the middle and he turned over K J 10 5 for top pair and a broadway draw. Nguyen turned over A 6 6 2 for a set of sixes and the nut-low draw. The 7 on the river gave no help to Ferguson and he was eliminated. Nguyen was up to 170,000 after the knockout. Michael Binger found himself all in against James Mackey. Binger was drawing to a 9-7 low but paired jacks and had to settle for a jack-low. The 9-7 would not have made a difference, however, as Mackey made a 9-4 low and Binger made his exit from the tournament. Note: Players have gone on a 60-minute dinner break and will return to action at 8:20 p.m.
Chris Ferguson completed to 3,000 and James Mackey raised to 6,000. Ferguson made the call and then led out for another 3,000 on fourth street. Mackey made the call and Ferguson bet 6,000 on fifth street. Mackey called again and both players checked sixth street. They did the same on seventh street and Mackey turned over 8-7-5-3-2. Ferguson mucked and Mackey took down the pot. Ferguson was down to 35,000 while Mackey was at 60,000. Ted Forrest was all in on fourth street against Phil Galfond. By the time their boards ran out, Forrest wound up with two pair, nines and fours. That’s never a good thing in razz, especially when Galfond made a 9-8 low and Forrest made his way to the exit. On a flop of 10 7 6 , Magnus Persson, the player in seat 3 and Dario Alioto all put in three bets. The turn was the 9 and Persson bet 6,000. He was called by both opponents and the river was the 8 . Persson bet again and was called again. Persson turned over A 9 6 3 for the nut flush and it was good for the entire high pot. Alioto and seat 3 each showed the same low and split the low pot. Alioto was at 40,000 while Persson was up to 185,000. Scott Clements completed to 1,500 and Jeffrey Lisandro made the call. Clements bet another 1,500 on fourth street and Lisandro threw in another call. Clements then bet 3,000 on every street afterward and Lisandro called him down. Clements then tabled (7 5 3 )4 6 K Q for a seven-high straight. Lisandro mucked and he was down to 40,000 while Clements was at 44,000. Picking up the action on a flop of J 5 2 , Daniel Negreanu and James Mackey each checked and saw the 3 land on the turn. Negreanu bet 3,000 and Mackey thought a few moments and released his hand. Negreanu took the pot and he was at 65,000. Mackey was at 26,000. Eli Elezra got his last 4,000 into the middle preflop and he was called by Pawel Andrzejewski. Elezra turned over his K J while Andrzejewski turned over 8 8 . The flop came down J 10 8 , giving Elezra top pair but Andrzejewski a set. The board finished off 3 7 and Elezra was out. Picking up the action after the board had run out A Q 8 A 6 , Erick Lindgren bet 3,000 and Eric Buchman made the call. Lindgren turned over A Q for aces-full and Buchman mucked. Lindgren took the pot and was at 68,000 while Buchman was down to 17,000. Benyamine won the hand with kings and he doubled up to survive with 385,000. 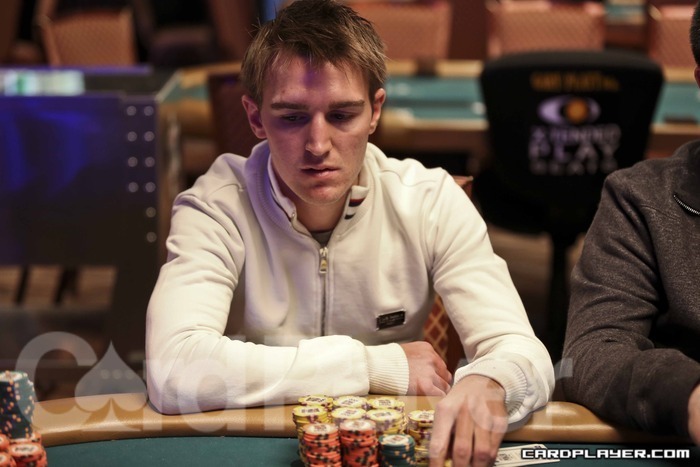 Mackey was crippled with just 3,000 after the hand and he was eliminated shortly thereafter. On his final hand Mackey held J-4 in the hole against the pocket kings of Amit Makhija. The board ran out J-6-4-K-4 and Mackey busted with a lower full house than Makhija, who grew his stack to 220,000. Entin won the hand to grow his stack to 450,000 and Matusow was eliminated on the hand. 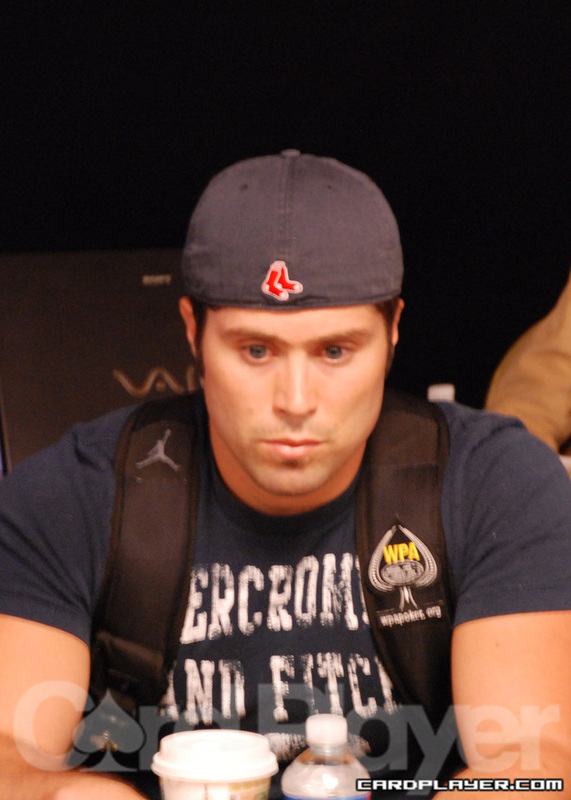 Rosenblum won the hand with quad eights to grow his stack to 580,000 and Rosenlbum was eliminated. Greenstein was eliminated on the hand and Mackey moved up to 280,000. Ivey was crippled on the hand, holding only 3,000. He moved that all in two hands later and an opponent knocked him out of the tournament with a pair of deuces. Late position won the pot with pocket kings and Mackey watched his stack plummet downward to just 52,000. Another level on day 2 of the 2009 Legends of Poker, and another fast level of action. It felt like the field was racing down to 100 players during the level, and when they headed to break just 104 players remained. The money bubble will not happen until 27 players remain so it looks like things won’t slow down anytime soon either. A lot of professional players beat up on each other during the level. Bryan Devonshire eliminated Kenna James early, and then Men Nguyen doubled up through Billy Baxter. Scott Montgomery was eliminated by Mickey Mills, Zach Clark was taken out by chip leader Steven Begleiter, and Allen Carter was eliminated by Allen Kessler. The chips continue to fly here are the Bike. After a series of preflop raises, James Mackey was all in holding pocket kings against Matt Marafioti’s pocket aces. Marafioti asked for the board to hold and the dealer obliged by spreading a safe jack-high flop and two bricks on the turn and river to send Mackey to the payouts cage. Shortly into the level, James Mackey found himself all in holding K-Q. Unfortunately, Greg Raymer woke up with A-K. The board brought a king, but Raymer’s kicker was enough to send Mackey home out of the money. After the hand, Raymer stacked ballooned to 1.67 million. Greg Raymer opened from early position to 30,000 and Vanessa Rousso made the call. Brian Rast then raised to 105,000 in the hijack and the action moved over to Alec Torelli. After a few minutes in thought, Torelli moved all in for 810,000. Raymer quickly folded, as did Rousso. Rast asked for a count, saw that his 650,000 was well covered and the folded. Torelli moved up to approximately 960,000. 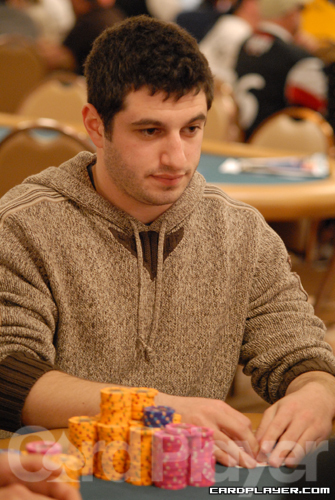 Phil Galfond found himself all in holding a dominating A-K against Justin Bonomo and his A-J. 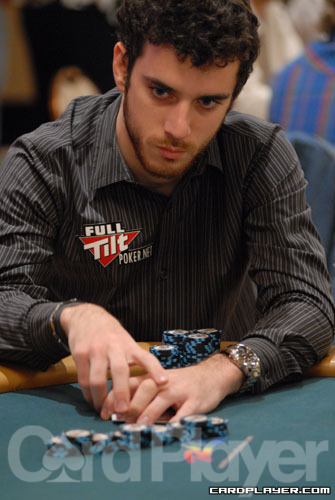 A king hit the flop and Bonomo failed to catch up, doubling Galfond to 488,000 in chips. Bonomo is still healthy with about 1.1 million. After an all-in and call, Sami Kelopuro revealed his pocket queens and was way ahead of Alan Sass and his pocket eights. The board ran out Q 6 3 J 4 and Kelopuro’s set of queens were enough to double him up to about 375,000 in chips. Noah Schwartz was all in on the short stack holding pocket kings against the pocket sevens of Chris Moneymaker. The board failed to help the 2003 champion and Schwartz doubled up to 320,000. Moneymaker dropped below the million mark with 910,000. On a flop of J 10 7 Sorel Mizzi is all in holding J-10 for top two pair against Frank Kassela’s and his pocket eights. Kassela needs an eight or a nine to bust Mizzi but the turn and river come 6 10 , giving Mizzi a boat and a newly formed stack of about 750,000 in chips. 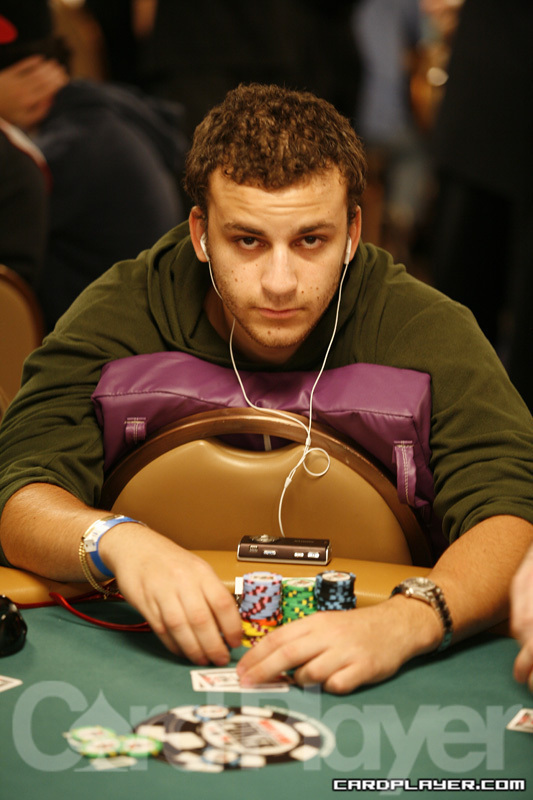 On a board of 8 8s 4 , Sorel Mizzi bet out 40,000 and Michael DeMichele contemplated briefly before calling. The pot stood at 150,000 at the moment. The turn brought the 4 and Mizzi tanked before betting 90,500 into DeMichele. DeMichele eventually called and the 4 landed on the river, putting a full house on board. Mizzi once again tanked before announcing he was all-in. DeMichele looked shocked and tanked for minutes before finally calling the 266,500 chip all-in from Mizzi. Mizzi turned over the A A and DeMichele eventually mucked. Mizzi is now among the top chip leaders, with 772,000. The short stacked Michael Watson moved all in with A Q and was called by James Mackey with pocket sixes and another opponent with pocket queens. Watson failed to hit the ace and was knocked out of the tournament. The button moved all in preflop and Vitaly Lunkin made the call from late position, covering his opponent. The recent RPT Moscow champion flipped over 10 10 and the button showed down 8 8 . The board ran out A 6 K 9 9 and Lunkin won the hand to grow his stack to 289,000. The button was eliminated and made his way to the rail. Rast doubled up on the hand to survive with more than 270,000. Amit Makhija moved all in pre-flop with ace king off-suit and was called by the A A of Mike Matusow. Makhija failed to hit any miracle and was eliminated by the three-time bracelet winner. On a board of 4 8 Q 10 10 , Alex Jacob moved all in for 137,000 against the big stack of Chris Moneymaker. Moneymaker went into the tank for quite some time asking Jacob if he would show his hand if he folded. Jacob was stone faced and took down the large pot once Moneymaker folded. Jacob is now up to 450,000. 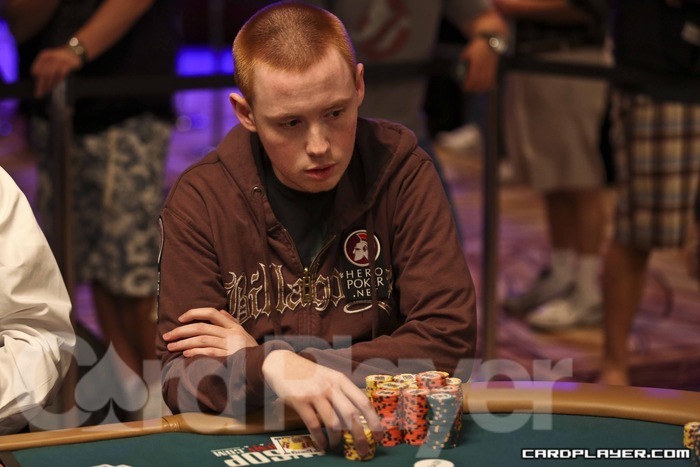 After some raising, James Mackey moved all-in pre-flop for 114,500 and Shawn went into the tank for minutes. Buchanan counted his chips, noticing that Mackey had him covered and eventually made the call. Mackey turned over K Q and Buchanan tabled the 10 10 . The flop of J J 5 was safe for Buchanan but the Q on the turn made the situation grim. The river brought the 7 and Mackey’s chip stack rose to 310,000.